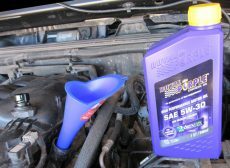 Oil change can be done in your garage or driveway. Depending on your lift and tires, you can do it on the ground or give yourself a little more room by using ramps. Make sure you chock the wheels before you get under your vehicle. Your 3.6L Pentastar engine uses 6 quarts of engine oil. Make sure you have the correct oil and filter ready before you start draining old oil. 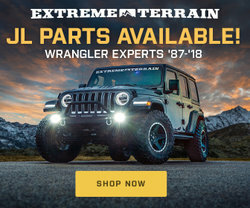 Refer to your owners manual for proper oil type (it should be also stamped on the oil filler cap) and filter model number (you can also call Jeep dealer or do a quick search online). Remove the plastic engine cover, by grabbing the front of it and lifting it up, to gain access to both the oil filter and filler cap. Locate the engine oil filler cap and rotate it counter clockwise until it stops. Do not remove the cap at this time. Climb under the vehicle and place an oil drain pan under your Jeep’s oil pan. Then, using a 13mm socket, loosen but DO NOT remove your engine’s oil pan drain bolt. Using your fingers, carefully remove the drain bolt and allow the used oil to drain. To limit oil splashing you can hold the drain pan closer to the drain hole first, and then while watching the draining oil, sat the pan on the ground. Back in the engine bay, locate the oil filter cap. Using a 24mm socket and a breaker bar or wrench, unscrew the oil filter cap. Carefully remove the filter cap with filter media attached. Use paper towels to catch oil dripping from the old filter media. Removing filter cap with the media will allow some more oil to drain at the bottom, so leave the drain pan in place. Firmly grab the filter media and pull it out of the filter cap. Using a small flathead screwdriver, carefully pry off and remove the rubber O-Ring installed on the filter cap. Take the new O-Ring that came with your new filter media and apply some of your engine oil to it. Install the new O-Ring onto your filter cap. Install your new filter media into the filter cap by pushing it into it until it snaps in place. Carefully reinstall your filter cap with new filter media attached, back into the top of your engine. Using a wrench with 24mm socket, carefully tighten the filter cap back in place. Please note that this cap is plastic and will break if you over-tighten it. Proper torque is 18 ft lbs. By this time all the oil should have drained. Reinstall the drain bolt and tighten it using a wrench with 13mm socket. Oil pan drain bolt torque is 20 ft lbs. Remove the engine filler cap, insert a funnel and pour in 6 quarts of oil. Reinstall the filler cap and tighten it. Reinstall your engine cover by snapping it into place. 1) Turn your ignition to the ON position but DO NOT start your engine. 2) Press the accelerator pedal to the floor 5 times. 3) Turn your ignition to the OFF position. That’s all there is to it. As mentioned, super simple and easily something that anyone can do. Please be sure to clean up your mess and take your used oil to a recycling center. Use the new empty oil bottles and carefully fill them with the used oil. Most auto parts stores such as AutoZone, PepBoys, Checkers will take your used oil free of charge.